It has a nice scent. This was the best episode of Soul Eater yet. An episode that’s sweeping, burning with feeling, with animation and character as a synthesis of the soul. Such anime is poetic, exciting and inspiring, such is Black Star and Tsubaki. I admire their loyalty, their affection for one another, that Black Star will take a beating for his friend, understands the strength of her spirit, and yet is close enough to know when to offer a hug. Tsubaki is shy; she isn’t often noticed and would rather take-on a little hardship to please another. That doesn’t mean she is arrogant or weak, but she needs someone around her to carry her along, to push her onto the stage, to support her. A friend, to support her trembling soul. Though it’s something we’ve come to expect from Soul Eater, I have to say the animation in this episode was superb. Not simply in terms of the fluidity of movement, which ebbed and flowed in waves of animated bliss, but the art direction too. The use of colour, the gloomy clouds and rain overhead as Black Star is beaten to a pulp for his friend and anxiously awaits her return. The metaphysical battle against her brother, the dull landscape that transforms with her victory into a tranquil paradise of clear sky and sparkling blue sea. It’s absolutely evocative and vibrant, swings and shifts with the tone and mood of character. It’s lyrical anime, streamlined, perfect. Wow, great screencaps as always. That reminds me, I actually need to catch up on the latest couple of episodes! I’m trying to ignore the SJ-derived drawn-out battles and occasionally grating character archetyes (I’m looking at you, Black Star) too because with those minor annoyances aside, this is a great character study in terms of people being compatible in a more far-reaching sense than, say, a simple romantic pairing. I’d even go as far as saying that this ‘weapon and handler’ concept has enough mileage to last the episode run, provided it doesn’t descend into repetitive filler territory. That’s what’s keeping me watching – and the artwork of course, which is so unlike Bones (hard to imagine they’re working on The Daughter of Twenty Faces at the same time, quite frankly) but so refreshing and FUN. I have to admit, I like Black Star. He’s an amalgam of my favourite shonen heroes, like Naruto and Luffy; a personality I’m so used to seeing in anime that I can relate to almost every facet of his character. To be honest, him and Tsubaki are my favourite pair, they really do make the show for me. After all, their relationship doesn’t have any romantic context, it’s deeper than that, as if they understand each other perfectly, on an almost spiritual level. I don’t get that feeling from any of the other characters, which are, as you put it, much more “simple romantic pairing(s)”. Soul Eater is fast becoming a series that I love unquestionably. Like One Piece, it has that perfect blend of style and substance, fun and conflict, that means I finish basically every episode feeling like I’ve just seen (as in the case above) something wonderful and exciting. This really was an amazing episode. It’s so easy to get cynical when so many shows in the same genre bring up similar themes, but something like this just transcends all that. The art really does lift this above the competition, and the dialogue is perfectly judged and never intrusive. The previous episode did a great job in setting the scene (especially Black Star not needing to even know Tsubaki’s motivation to back her), and then it just took off. Too good. I loved this episode and the one previous to it. I almost (almost!) talked about it, but I didn’t know if I could say anything that wouldn’t sound like “WOW” repeated over and over again. I also wanted to give the show more time to settle down before I proclaimed something about it and then had to retract things; it looks like it’s getting much better than I expected from the beginning, and it’s just a matter of waiting until I have something to say about it. And, even though Soul Eater can be outright hilarious when it wants to (witness episode 14, which was amazing comedy), I kind of wish it wouldn’t throw pointless comedy in the more serious scenes (like 10 and 11)–it breaks the tension too much. Also, Soul Eater runs in Shounen Gangan, like Fullmetal Alchemist, which is Square-Enix’s manga serial. Nothing to do with Shounen Jump whatsoever. I have to admit, I’m finally feeling the payoff from sticking with this series. Up until the latest Black Star/Tsubaki arc, I was actually considering dropping it because I found it so disappointing. It’s surprising that it’s actually my least favorite duo that ended up salvaging it for me. Hopefully, the other pairs follow suit and offer up some great development as well. I have to be honest, this episode is by far my favourite so far. I remember reading the chapter a few weeks back as well, i really found it made Black Star far more likeable than he was before. It showed a different side to him in my opinion, which we hadn’t seen till now. Instead of pushing himself to be the one on show, he sat there watching and protecting Tsubaki as she fought her battle. Tsubaki as well, showing she isn’t weak and she does have the determination to fight and push herself forward, whether that was because of her battle with her brother or black star, i dunno. They are probably my two favourite in the series at the moment, and i can’t wait to see the rest of the series animated, since if this episode itself is anything to go by, i’m expecting it to be quite promising. I’ve started watching Soul Eater (after being swayed by the art direction and overall style of the anime). While I really like it (and episode 11 was one of the best eps so far), I still haven’t truly connected with any of the characters. Eps 10 & 11 develop the characters of Black Star and Tsubaki and I’m starting to care a little about them. What makes One Piece and early Naruto so good is that you get background on the characters and see the pain they have endured. You understand why the characters try so hard. Soul Eater is only staring to give us some of this connection (of course, it’s still early in the series). Still, the style of Soul Eater is unquestionably fantastic (rivaling Samurai Champloo and Sayonara Sensei), and I intent to watch more. @coburn: I loved the previous episode too. In particular, the way Black Star and Tsubaki were hanging out high up on that tree branch over-looking the village. That whole scene was so evocative. @OGT: Ahh, the Shonen Jump tag is a Freudian slip on my part. Will fix it. Anyway, if you do get the impulse to blog on something, even if it is just to say “wow”, I think you should go for it. Although a lot of blogging seems to be quite calculated and analytical, I think the best entries are those that are raw and flowing with emotion. As for myself, episodes like this (and series like Soul Eater) are the reason why I’m still an anime fan today, so I wouldn’t be being true to myself (or any of the people reading this) if I didn’t at least say something about it, even if it’s just a couple of paragraphs, I have to say “this was good”. 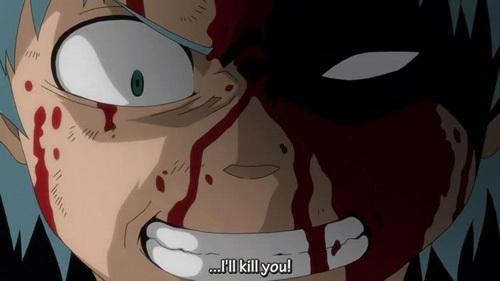 @Sagacious1: You were considering dropping Soul Eater? Are you mad?! 😉 On a more serious note, I’ve loved almost every episode of this series, but (remembering my previous Soul Eater post) I understand others aren’t so taken with the shonen action genre. Anyway, I’m looking forward to seeing if they can force us to invest some serious empathy in characters as strange as Death The Kid. I suppose Soul Eater is a lot like One Piece, in that it requires us to laugh at characters doing stupid things, only to care about them moments later. @Arbalest: Did Black Star and Tsubaki remind you of Naruto and Hinata from Naruto? They did me, right down to how Hinata’s family gave her all the power, despite her cousin Neiji being (ostensibly) stronger. I wouldn’t be surprised if that’s where the inspiration for Black Star and Tsubaki came from. @bateszi: Yeah. I let myself loose in the Code Geass episode 13 post (because I had been a diehard Shirley fanboy from episode 1 of s1 and there was no way I was letting the opportunity to rage incoherently pass me by). I tend to shy away from it because it seems (to me) like a plea for attention/trawling for hits or what have you–which is part of what being a blog is all about, I think, so whatever. I also shy away from them simply because they tend to be volatile, lest I say something in the heat of the moment that isn’t exactly right or that inaccurately reflects my assessment of something. I’ll probably do things of those sorts later (I do have a “zero content” category for whenever I do something that isn’t a “normal post” by me, but, then again, what is a normal post? ), and pretty much every post on Itazura na Kiss is partially “HOLY CRAP THAT WAS AWESOME” anyway. @bateszi: Yeah i did get that impression, the whole fight between Hinata and Neji would be probably the best example, where naruto urged her to fight on. Ok the battle turned out in favour of Neji, but if i think about it, Hinata did win something out of it, a bit of courage and she showed she wasn’t as weak as everyone, or more precisely, her brother thought she was. Tsubaki gave me that exact feeling, and even though Black Star couldn’t urge her on like Naruto did, there was that sense that he was anyway. I began a contribution as site for exclusive use of naruto. Please link to this site if I do not trouble you. I intend to publish a related story of naruto serially steadily from now on. Please cheer it. @Helen: It was a metaphysical battle of souls. 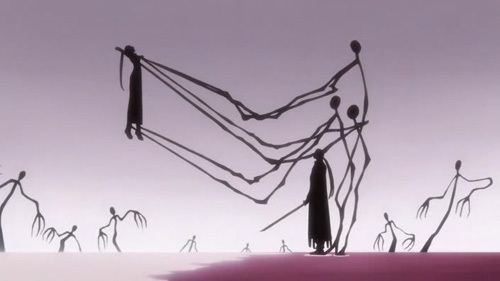 Obviously, you can’t stab someone’s soul, so it’s really just pretty symbolism for the sake of beautiful animation. 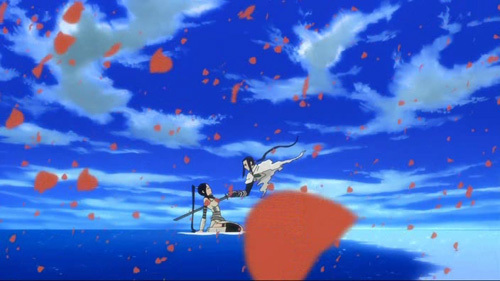 Essentially, Tsubaki won because her brother realized he still loved her. Oh my dear god, I am so glad, so glad, so infinitely glad you blogged about this episode. I FINALLY caught with all the episodes of Soul Eater, starting with this one and this one is the one that remained most prominent in my memory. My god, it was beautiful. I’ve never really payed attention to Tsubaki until this episode, she was just as they said, a scentless flower, until…right this episode…!!! 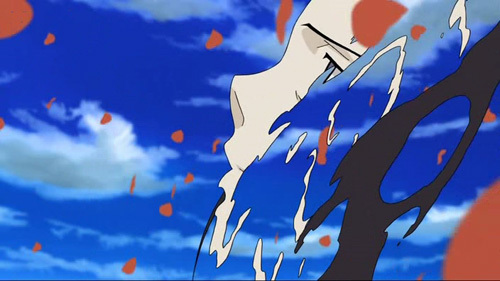 I sat through the episode knowing that Tsubaki was going to live, just knowing and it was so good watching it happen. I was ready to weep when they started hitting Black Star, but he stayed there, he stayed there with her. The flashback really caught me off guard, the flashback made this episode for me, it really showed the nature of their relationship. That scene change, I have to agree with you, have to, have to, from the gray and dreary world of her brother, to her world, a wide, open blue sky and the flower petals, god, that was amazing. Soul Eater is a show I’ll never have trouble watching, the animation is consistent, BONES always delivers. The story gets better with time, layer upon layer, it works to lead up to something as priceless as this episode. Baaah….this episode was good. Good, good, good….I’m so glad you blogged it, I’m so glad you liked it. It’s shows like Soul Eater, episodes like these, finding your post and being able to leave my rambling comment that really, really remind me why I love all of it so much. @Xerox: Thanks for such a lovely and inspiring comment. That’s all I can say, really. I’ve read it three or four times now and each time it’s wonderful.